Are you ready for UFC Fight Night 143? Thanks to a new agreement with ESPN, the ​Ultimate Fighting Championship will be live from the Barclays Center in Brooklyn Saturday night streaming live on the Worldwide Leader's ESPN+ service. And to help ratchet up the hype, Henry Cejudo decided to troll his opponent for the night' main event, TJ Dillashaw. Dillashaw, who is occasionally known as the Snake when he isn't being called the Viper, notably moved down from bantamweight to flyweight to take on Cejudo in the title fight. And the flyweight champ didn't waste an opportunity to get inside his opponent's head. 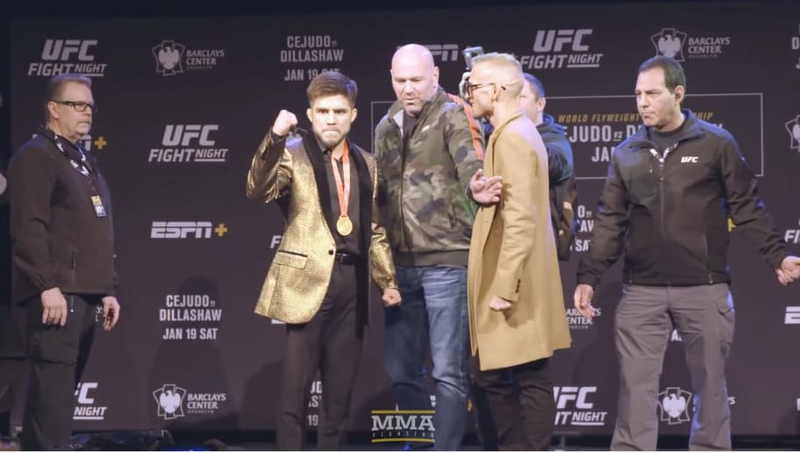 Yes, that was ​Dana White handing Cejudo a bag that contained a fake snake. And he slammed it against the floor. If you're not ready for fight night now, nothing is going to do it for ya.